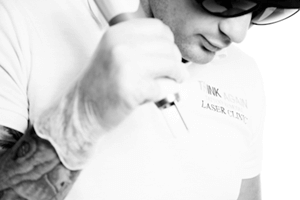 At Sydney’s Think Again Laser Clinic we have seen a wide variety of clever marketing techniques which are currently being used to sway the consumer within the laser tattoo removal industry. 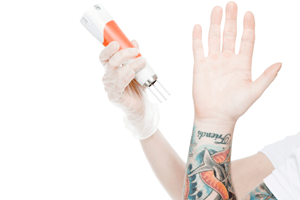 In a market where education is key, we would like to share our knowledge and provide some insight on the misconceptions within the tattoo removal industry. Some of which have seen our clients left disappointed by previous clinics and/or pay more than they needed to without achieving the desired result. Over the next few weeks we will work to debunk some of the marketing techniques used throughout the industry, which can either confuse, or even mislead the consumer. Case 1- Five treatment guarantee using Picosure or “The Pico Promise”. 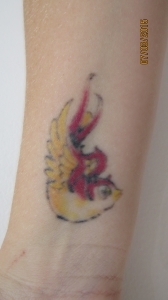 This client was given a five-treatment guarantee on her Red, Yellow and Black tattoo. However, if the tattoo by chance required more than five treatments they would continue to treat the tattoo free of charge. It is indeed to stay updated with how to safely get a tattoo removed. Sounds like a fantastic deal right? Wrong! The PicoSure CANNOT completely remove Red, Yellow, Orange, or Pink inks, simple! In order for the laser beam to directly target these colours of ink a 532nm ND-Yag laser is required. The PicoSure does not use this wavelength. You could be treated by the Picosure 1000 times and this coloured ink will not be completely removed. 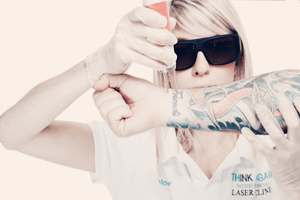 Successful laser tattoo removal depends on the use of multiple wavelengths in order to directly target different coloured pigment. The Quanta Q Plus C is in fact the only true three wavelength system on the market able to directly target ALL colours of ink. 1064nm is used to target black and dark pigment such as purple, 532nm targets red, yellow, orange and pink and the Ruby Laser 694nm directly targets blue and green pigment. The Picosure is limited to one single wavelength (755nm). Taking into account the science behind tattoo removal and the obvious need for multiple wavelengths, the PicoSure will unfortunately lack the results they guarantee. A client’s account of her PicoSure experience on treating multiple of her tattoos. This client unfortunately placed her faith in the clinic and their ‘Pico Promise’, spending in excess of $4000 in hopes of achieving complete removal of her wrist tattoos in time for her wedding day. After FIVE unsuccessful treatments on multiple tattoos it became clear that the technology being used was not to a suitable standard that was required for the removal of this tattoo. Further research brought her to Think Again Laser Clinic. After 4 treatments in our clinic priced at $120/ session this client is on track to have her tattoo removed in as few as 6 sessions for a total cost of approximately $720. With the Quanta’s ability to target multi-coloured pigment, the removal process is guaranteed to be highly effective. If this client was treated by this machine from the start, she would have required less treatments, saved money and ultimately had her tattoo removed in a much shorter timeframe. So why the big price difference? The sale of the Picosure is the single best marketing campaign for a laser system the world has seen. Unfortunately this has lead to enormous promises of guaranteed results, which are now turning out to be inaccurate or even fabricated. The PicoSure laser system is sold with very few examples provided of complete removals, yet the price of this system is over TWICE the price of the Quanta Q-Plus C.
At the end of the day this results in a much higher treatment cost to the consumer with varying degrees of success being achieved. Even the best results being achieved by this system can be matched by the Quanta Q-Plus C at a fraction of the price. Still considering the PicoSure? A current Class Action Law suit is being conducted in America against the Manufacturer. Unfortunately until this case is closed, the operators of this system still need to keep their business viable and will continue to market this system as the ‘go to’ for tattoo removal. It seems PicoSure have also realised their current system lacks the ability to remove all colours so have now created an additional upgrade- a ‘mock’ 532nm Dye Filter Hand piece! For those willing to forgo an additional cost for this upgrade it will lack the effectiveness of the ‘true wavelength.’ The maximum available power of this expensive upgrade is 1.1 J/cm. This is NOT enough power to remove even the lightest examples of these inks. The cost of upgrading the machine is also at the end of the day passed onto the consumer through higher removal prices with very questionable ability to remove the ink. The Quanta Q plus C has 11 J/cm for the 532 nm wavelength. That’s 9.5 J/cm more than the PicoSure. 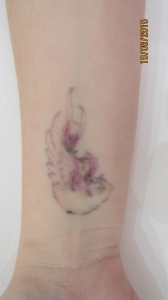 The lowest setting used for a very light red tattoo for a test patch in our clinic is 2.5 J/ cm. Since each session requires an increase in power to continue to break the ink particles down further, the available 1.1j/cm using the ‘new handpiece’ for the PicoSure will nowhere near be effective enough. It is not uncommon to use up to 7 J/cm for very faded red, yellow or orange inks, this is more than 6 times the available power in the PicoSure upgrade. 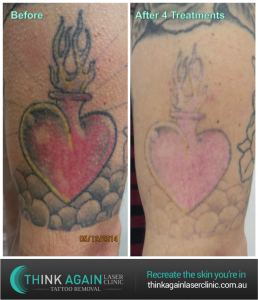 Below are the results achieved on red ink at Think Again Laser Clinic after only 3 sessions. More sessions are required on the black, but this is a total removal of red, at a cost of $330. No promises, just results. 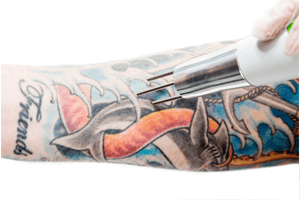 If you are guaranteed tattoo removal after very few sessions, you need to ask more questions and for further examples of tattoos similar to yours achieved in THEIR clinic. Do not settle for before and after photos provided by the manufacturer. At Think Again, we have never used our Quanta manufacturer provided images for marketing purposes. Instead we pride ourselves on being transparent with each of our clients while setting realistic expectations. For more information on Manufacturer provided images check out our blog on the topic. There are no guarantees in tattoo removal. The only guarantee is that if you guarantee results better than what you are able to achieve, you will upset your clients and eventually cases such of these will occur. Always ask your clinic to verify their claims with evidence of results they have personally achieved. Each day the Quanta Q plus C proves itself to be the highest industry standard for tattoo removal. 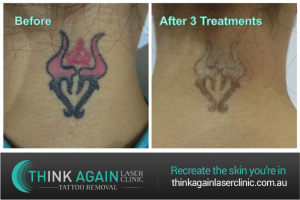 Until the day better technology exists, it will be the ONLY laser backed by Think Again Laser Clinic.